CGPSC Assistant Professor Exam Previous Year Question Paper: Applicants can begin preparing for the online MCQ test through CGPSC Previous Year Question Papers. Total 19 subjects previous year papers are mentioned below for the year 2014. The question papers are in Pdf form. Candidates can hence download them or save them offline to prepare. You can share them with other candidates too. The Chhattisgarh Public Service Commission has declared a total of 1384 seats for the post of Assistant Professor in various subjects. Online applications for the same began on 4th February 2019. To check the recruitment information in detail please check our article linked below in the “important links” section. There are other articles like admit card, and syllabus too. 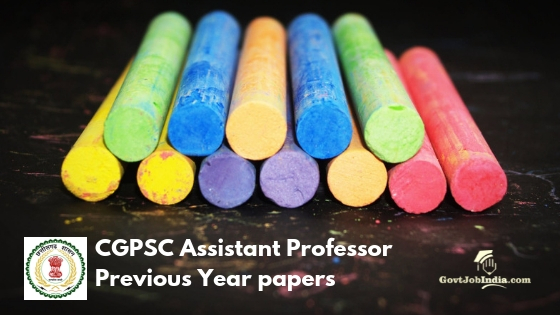 The CGPSC Assistant Professor Previous Year Question Papers are linked below. Applicants are requested to click on the link and get hold of the study material. Bookmark the page so you do not miss the important updates. As soon as we receive more study materials related to the online test, they will all appear here. Please check the CGPSC Previous Year Question Papers linked below. You can simply click on the links and download them to prepare for the online test. In case we receive more such exam papers we will add them here. Ensure that you bookmark the page so other updates and papers are not missed. Also, consider the selection procedure, exam pattern, syllabus, and recruitment details. They would be helpful for a good preparation. By this candidate can know which part of the CGPSC Question Paper is more important than other. The State Commission has set 2 stages of selection procedure followed by the final selection. All the applicants would need to pass both of these stages in order to get through the competition. Stage 1 is an online MCQ test comprising 300 marks and 150 questions. Post that would be an interview comprising 30 marks. So total 330 marks will be considered for the final selection. Combined performance in both the stages matter equally for the applicants. Ensure that you give equal importance and prepare accordingly. Marks or scores for online MCQ test will be calculated based on a separate formula set by the recruitment board. Please check the below image to know the selection procedure, marks allotted, and final selection formula. Please refer the above image that includes the Exam Pattern in brief. MCQ based online test is set for 300 marks, 150 questions, and 3 hours of time period. These 300 marks includes 150 questions. 100 questions would be General Knowledge based and 50 questions would be related to the filed/subject you are applying for. Kindly note that the Annexure 2 includes all the details regarding syllabus. General Knowledge is regarding the state of Chhattisgarh. Check the topics below. To know about the subjects/topics included in the field related part, please check Annexure 2. You can also check our syllabus article linked below. Best wishes from our team to all the candidates. We hope the content above is helpful to learn and prepare well. CGPSC Assistant Professor Previous Year Question Papers can also be shared with other candidates you know. If you have any questions or doubts based on the same, please let us know. Enter the doubts in the comment section below. Our team will surely get back to you. To know more about the Government Job Opportunities near you, check our website @ govtjobindia.com. There are options for all based on various locations, sectors, and educational qualifications.